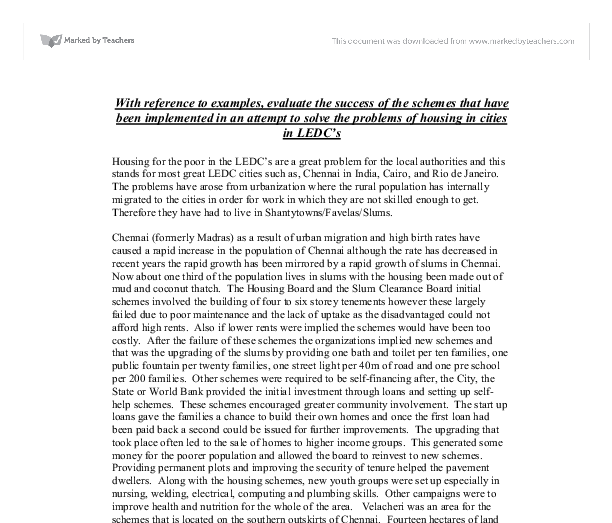 With reference to examples, evaluate the success of the schemes that have been implemented in an attempt to solve the problems of housing in cities in LEDC's Housing for the poor in the LEDC's are a great problem for the local authorities and this stands for most great LEDC cities such as, Chennai in India, Cairo, and Rio de Janeiro. The problems have arose from urbanization where the rural population has internally migrated to the cities in order for work in which they are not skilled enough to get. Therefore they have had to live in Shantytowns/Favelas/Slums. Chennai (formerly Madras) as a result of urban migration and high birth rates have caused a rapid increase in the population of Chennai although the rate has decreased in recent years the rapid growth has been mirrored by a rapid growth of slums in Chennai. Now about one third of the population lives in slums with the housing been made out of mud and coconut thatch. The Housing Board and the Slum Clearance Board initial schemes involved the building of four to six storey tenements however these largely failed due to poor maintenance and the lack of uptake as the disadvantaged could not afford high rents. Also if lower rents were implied the schemes would have been too costly. ...read more. Old Cairo is sited east of the modern CBD and went under dramatic population expansion after the 1950's and between 1968 and 1982 alone the area of the city doubled. The fertile irrigated farmland along the banks of the River Nile was sold and illegally built on at an average of 600ha a year. Cairo is different to other LEDC cities as rather than having shantytowns on the fringes it has brick built houses and flats, which have often been constructed in stages. Many of these houses have been built illegally on state owned or 'green' land and today these houses cover an estimated 80% of Cairo's built up area. These houses are very overcrowded and in the summer temperatures over 400C are common along with broken or non-existent sewers generate extremely unpleasant living conditions. Cairo's poorest citizens have situated in two other peculiar locations. In the Cities of the Dead, an estimated two to three million people have taken up residence in tombs or like the other half a million people live on rooftops in the city center. In Old Cairo properties are on the point of collapse due to lack of repairs or reckless additions of extra stories that have destabilized the foundations. ...read more. This means turning alleys into streets, dead ends into lighted plazas and financing the building of proper homes inside the favela. Favela Bairro has brought many improvements to the people of Vidigal. The favela has re-conquered an abandoned sports center that had fallen into the hands of drug dealers and now is the official venue for soccer championships. The citizens of the shantytowns are awaiting a cable car that will relieve them from the irregular and expensive mini-vans. The fruits of Favela Bairro have reached some 45,000 people in 105 favelas. Now in its fifth year the program ahs won several prizes including one form the Inter-American Development Bank (IBD) as well as the famous Habitat award from the United Nations. From studying the three major LEDC cities it is clear to see that for each scheme there has been some success, however some schemes have been a lot more beneficial to the people. As the most successful schemes have revolved around self help schemes that can be made affordable for even the poorest sections of the shanty community. They also maintain a community spirit and enable the families to continue to access their places of employment. The less successful schemes include the high-rise flats and those involving re-housing of the squatters on the periphery of the cities or beyond. The disruption of the families destroys the community spirits and their ability to earn a living. ...read more. A very good essay that is clearly focused on answering the question set. Tackles the main point of the question which is to 'evaluate the success' well. Some minor omissions such as data in places but otherwise an excellent response. The middle class residential is further away than the factories/industry and the high class residential is located upwind away from the industry/factories and the low residential districts. I do not think this is like Leeds CBD as there are high, middle and low class residential areas all over Leeds not just in a specific area. Community development is "a process which embraces community action, community service, community work and other community endeavour, whether geographical or issue based, with a bias towards the disadvantaged, impoverished and powerless in society." (Community Development Review Group, 1991) According to DANI (1994), rural regeneration is firmly built on community development and its principles. The E.P. is an excellent example of this. Two factors have helped rebrand Cornwall and promote 'destination tourism': * Individuals, such as TV chef Rick Stein, whose seafood restaurant at Padstow in north Cornwall has led to large numbers of tourists who are interested in his restaurants and food shops. London Docklands. Has the regeneration been a success or a failure? Employment had been a problem for the locals since the major docks closed down, and with the slogans 'why move to the middle of nowhere when you can move to the middle of London' has attracted people from outside the city. 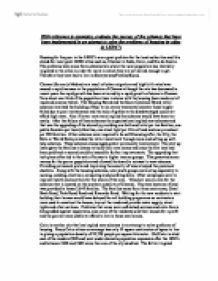 Rio de Janeiro- problems and benefits of urban change in a L.E.D.C. This is because of the physical constraints around the city, on one side is the sea and on the other mountains. This lack of space means that more and more people have to live in Favelas. A Favela is a residential area of sixty families or more living in accommodation that lacks basic services i.e. area using different colours to show what the land is being used for, like residential, commercial or industrial. They are very useful for city planners and architects as they show everything, unfortunately they get outdated quickly. They are good though because they can show house prices and land values. Also Powys is a very accessible area and therefore makes it easy to commute to a large city in the west midland from there. Why Powys? Powys is a county that could have been predicted to have an increase in population due to the decrease in population in the city of Birmingham.